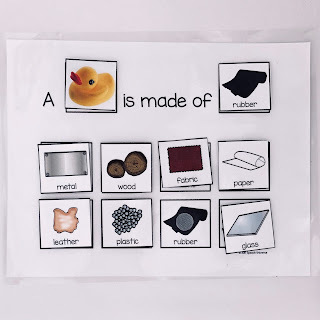 Now that you are all settled into your new speech and language room, you'll have to find out who you are supposed to be seeing with all of those well-organized materials. 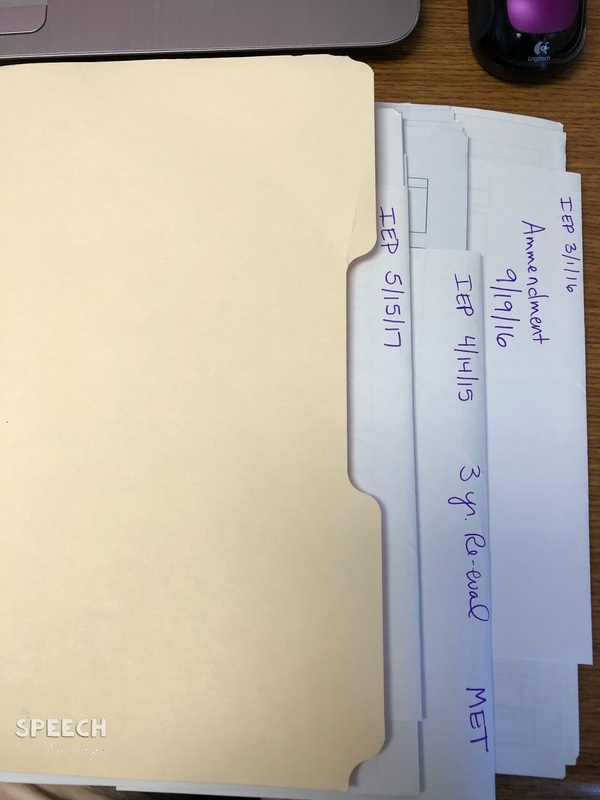 The first thing you'll need to do is either print off a caseload list from whatever your caseload manager/IEP program is on your computer or maybe your special services department will print one for you. Either way, you need to get your hands on this information. Once you have your list, you are ready to go! 1. Find their files. 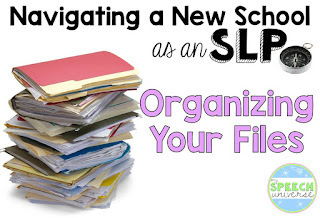 The previous SLP should have left you all of the files for your students. This should contain at least the latest IEP. It may contain previous testing and testing protocols as well as notes on the student. 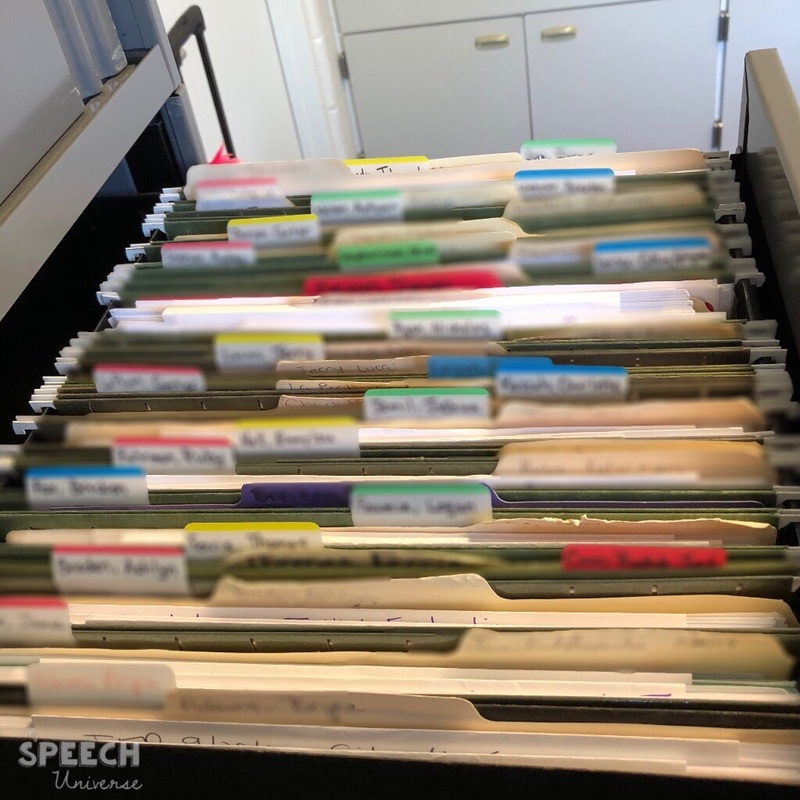 I like to organize these files using recycled pieces of paper from the teacher workroom. I fold the paper in half so that the white side is facing out. Then, I place the reports/IEPs/other information into that folded half-sheet. On the folded edge of the paper, I write the information about what is contained in that section. 2. 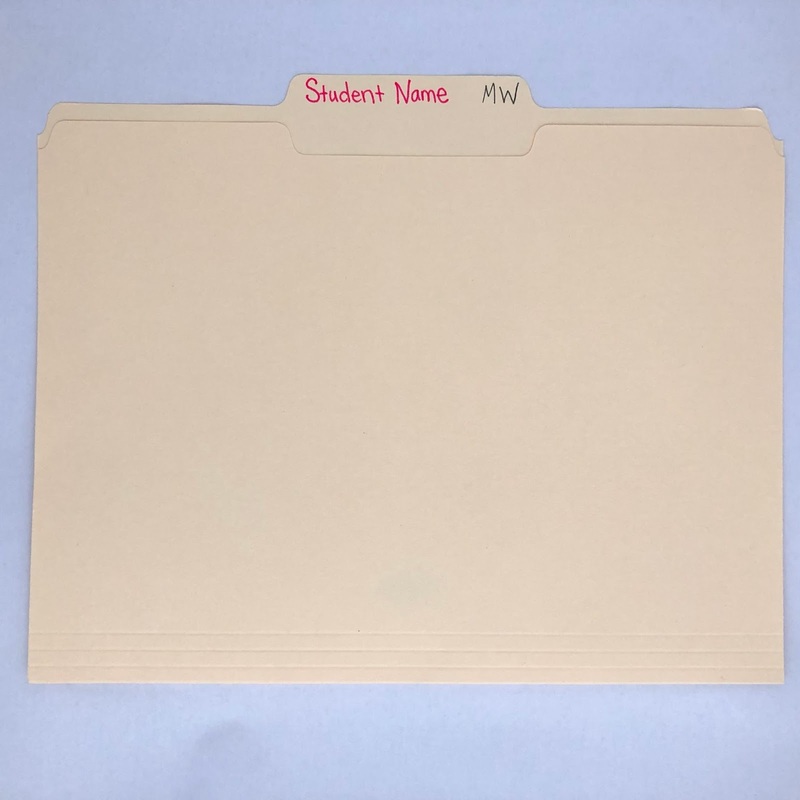 Make a hanging file for each student. I love to use those sticky file tabs from Post-It. 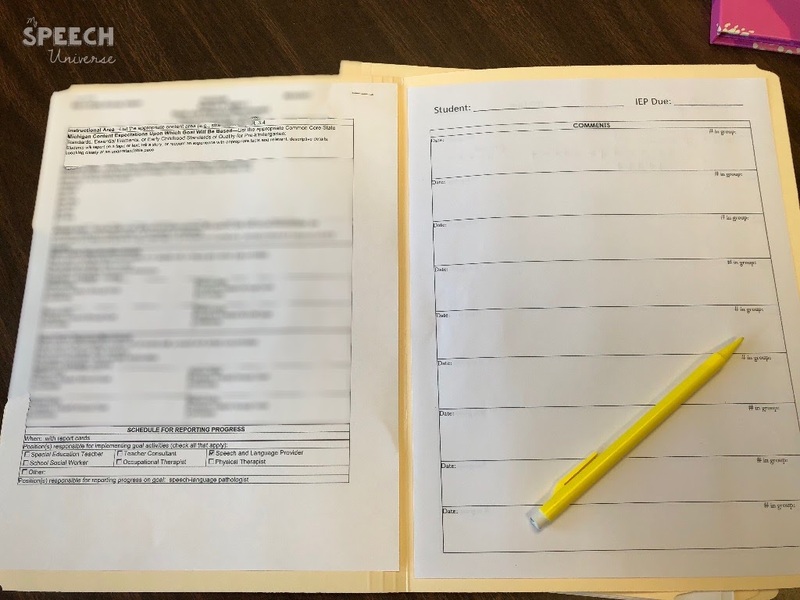 Use your caseload checklist to make sure you have every student's file accounted for. Place your student files into each slot. This drawer will be so organized that you will want to show it off! 3. 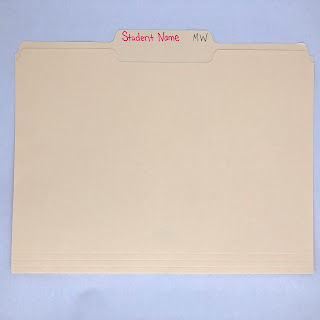 Make a working file for each student. This file is completely separate from your file with all of the IEPs and testing. This is what you will use on a daily basis with your students. 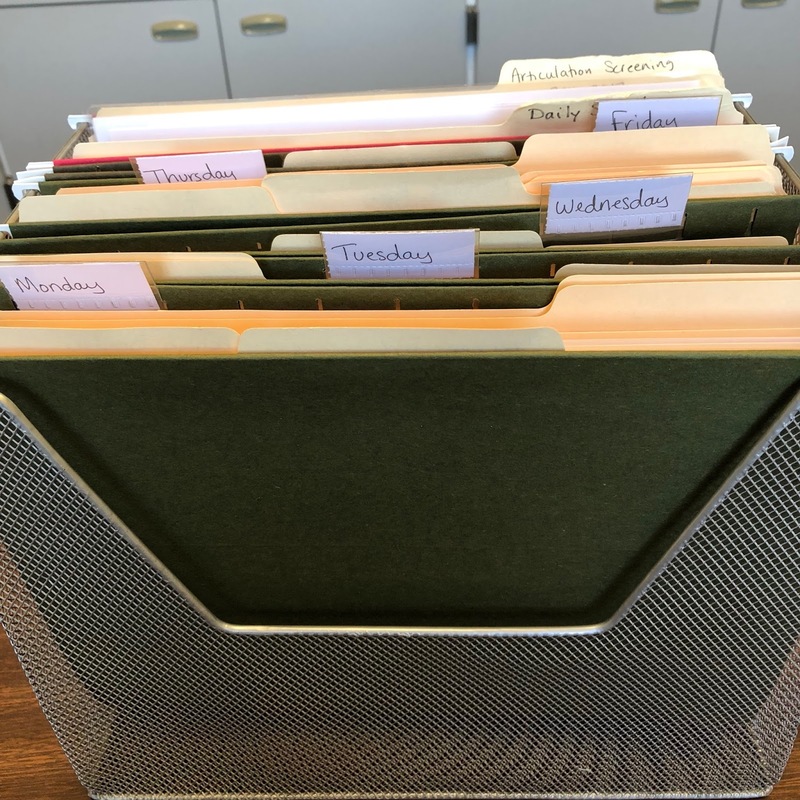 In my daily file folders, I like to keep a copy of the goal sheet and a data sheet. The goal sheet on the left makes it super easy to reference goals while I am working with students to make sure we are on the right track during sessions. 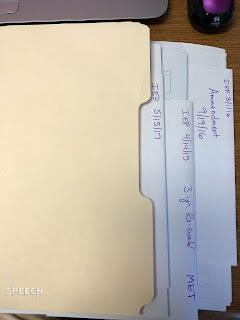 I write the name of the student on the file tab in pencil so I can easily change it if I find out that the student goes by a different name than their legal name (ie., Nick instead of Nicholas). I also use this space to indicate which day (or days) of the week I see the student. I write this in pencil with a simple M T W Th F next to the student's name. I use pencil so that I can easily use this file for a couple years and just change the day of the week each year. 4. 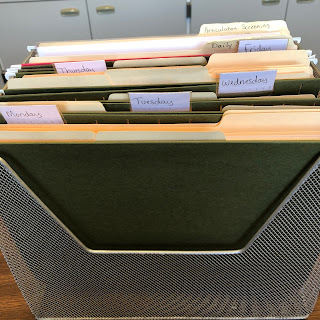 Make a separate hanging file holder to store your daily working files. I like to have a hanging file for each day of the week. Then, after my schedule is made, I place the daily folder into the hanging file for the day of the week that I see the student (don't worry, you'll get to your scheduling soon). Now you are ready to schedule those students. We'll get into that in a different post. Hope you can use some of my tips for organizing those files! 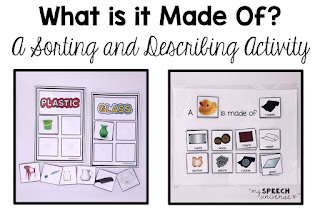 Describing the Composition of Items: What is it Made Of? I love working on describing with my language students. 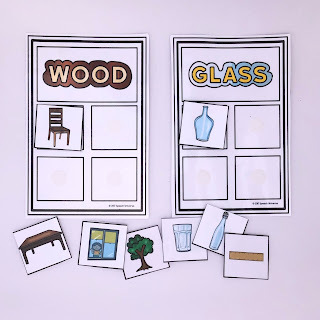 It is a great way to help organize their language. My go-to for working on describing is the Expanding Expression Tool (EET). It is an awesome visual representation to use with my students. One of the parts of this tool that my students always get stuck on though is composition- what is it made of. This just doesn't seem to be something that is in their prior knowledge. 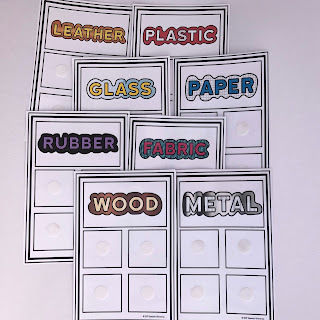 I wanted to make a little activity to help my students with this, and came up with a sorting and describing activity. 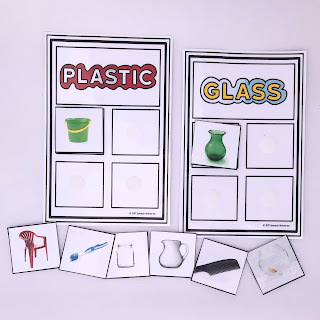 This packet contains 8 different materials mats with 24 clipart items and 24 real photograph items to sort. One thing that my students who are working on describing have is formulating a complete sentence to describe items. I created a sentence starter mat to help formulate these sentences. You can use the item cards from the mats to create the sentences. 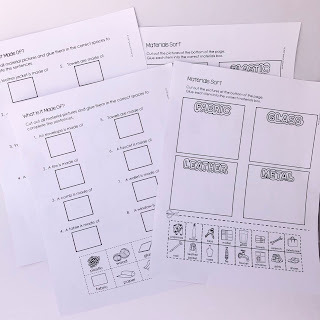 I always like to have a little something to send home to students, so I also created four worksheets to go along with this describing activity. 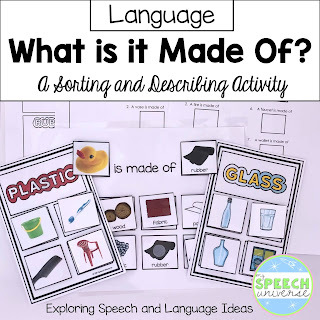 There are two materials sorting pages and two sentence creation pages. You can get What is it Made Of? HERE. I have had some good results with my students using this activity. They are able to see that there are many different materials that an item could be made of. I hope you and your students will enjoy this activity too!